With the British Open this week in Muirfield, it seemed appropriate to share some of our photos and thoughts from our recent trip to Scotland. Some of you already know, our son, junior golf Clay Merchent was in a golf tournament in Craigielaw, about 45 minutes outside of Edinburgh in May. So the Merchent family traveled to Scotland. This week we hope to share some of the images we captured while we were there along with some of our thoughts and observations about the amazing home of golf. I captured this image at about 4:30 a.m. the first morning we were in Craigielaw. 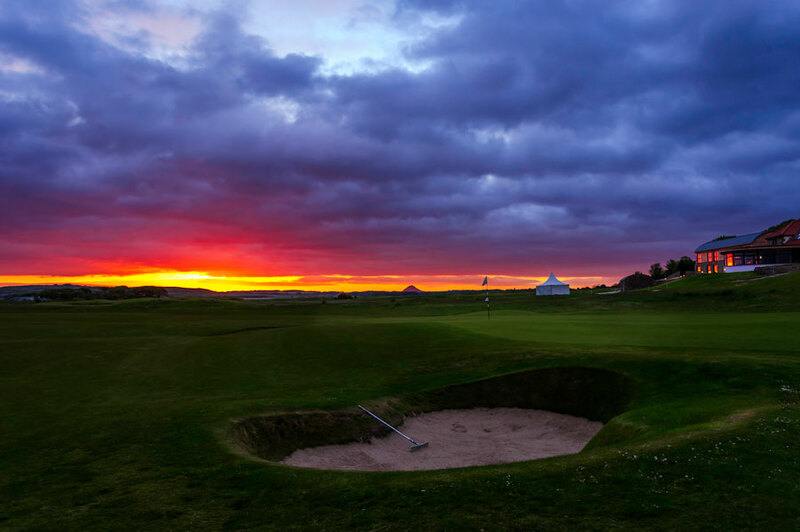 You are standing behind a sod-faced bunker, looking into the 9th green, clubhouse on the right, scorers tent just to the left of the clubhouse, and an inlet of the North Sea beyond. It was a glorious sunrise. The part that captured my eye the most was the magnificent reflection of the sunrise in the clubhouse windows. Funny thing is, while you can get out the fire escape door at 4:15 in the morning, you can’t get back in at 5:30. Luckily there was a night watchman that let me in, and then when everyone was up and moving, I was treated to a proper Scottish breakfast! Craigielaw golf course is just about 5 minutes from Muirfield where the British Open is being held this week. Great photo. Even better story behind it….. What would a typical Scottish Breakfast consist of? Of course a pot of breakfast tea, a rack of toast, blood pudding or haggis (for Mike and Clay not me) and eggs. Somehow the tea is so much better in Scotland. I’m pretty sure the scenery has an impact on the flavor.